Valar Morghulis. All Men Must Die. 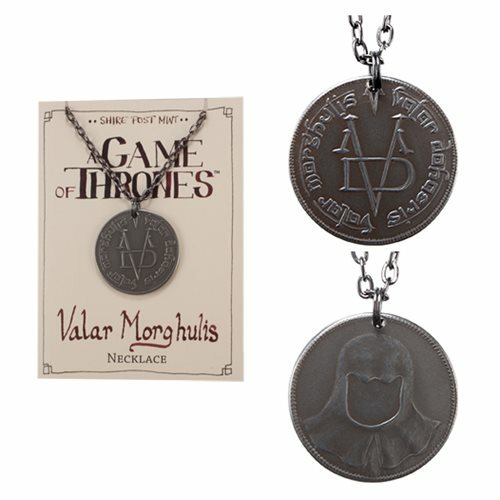 This necklace features the coin given to Arya Stark by the mysterious assassin, Jaqen H'ghar. The obverse of the coin depicts a hooded figure with an indistinct face. Depending on the light, he may seem to change in appearance. Inscriptions on the reverse show a VDVM symbol in the center, surrounded by the words, "Valar Morghulis, Valar Dohaeris: All men must die, all men must serve." The 18/8 stainless steel coin comes on a 30-inch gunmetal chain. Coins are made one at a time in the USA using antique machinery and traditional coining techniques. Officially licensed A Song of Ice and Fire merchandise. Ages 15 and up.